The nomads of the Indian state of Jammu & Kashmir (J&K), who spend entire summers in the Himalayan highlands, are often victims disasters worsened by climate change, and just as often ignored. While floods and landslides are occurring in increasing frequency, linked to extreme weather events, much of the reporting happens from urban areas. The nomads — Bakkarwals and Gujjars in Kashmir and Jammu and Changpas in Ladakh — rear sheep, goats and cattle in the upper reaches of the mountains. According to the 2011 census, the Gujjars and Bakkarwals constitute 11.9% of the state’s population — 1.5 million out of 12.5 million. They are the third largest ethnic group in J&K after Kashmiris and Dogras. Bakkarwals, numbering around half a million, migrate to different alpine pastures in the state, while most of the one million Gujjars live in mountainous areas where they depend heavily upon livestock rearing and small-scale agriculture. 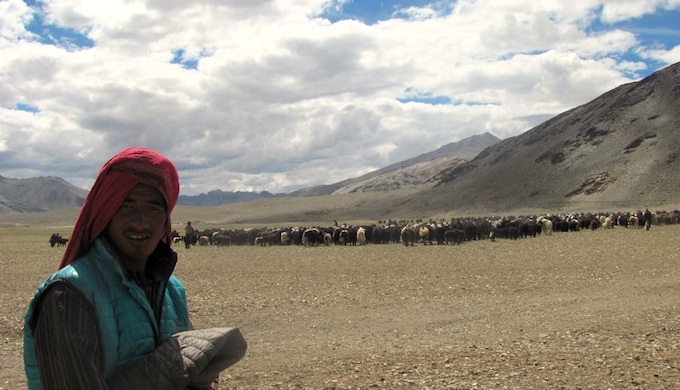 The nomads say that higher frequency of extreme weather events, shrinking of pastures and the raging armed conflict for over two decades have taken a heavy toll on them. “In today’s time when flash floods, landslides and cloud-bursts are killing our community members and livestock like never before, we need help from the government for our safety,” leader of J&K’s Bakkarwals, Choudhary Abdul Aziz, told India Climate Dialogue. According to him, in flash floods and cloudbursts, the nomads lose hundreds of sheep and goats every year. Last year, he said, around 30 families lost their entire herds of sheep and goats in Kulgam and Lar areas of Kashmir when a flash flood caught them unaware. Another family, he said, was completely wiped out by a landslide along with their 70 sheep. Choudhary went on to say that in 2014, one of the nomad families lost 150 sheep in the flash flood in Nadimarg and three families were washed away by another flash flood in Pahalgam. Rahmat Ali, a nomad from Rajori, said that the area for grazing has diminished considerably over the past few decades. Earlier, he said, most of the nomad families used to have herds of more than 500 which have now come down to around 150 in an average family as pastures are increasingly getting out of bounds for pastoralists. “People now own grazing lands in various areas; they charge us if we graze our livestock there. Pastures are now with the wildlife department, social forestry department, security forces and landlords,” Ali told India Climate Dialogue. Sonum Lotus, the director of meteorology in the state’s summer capital Srinagar, said that since the nomads move way up in the highlands for grazing their livestock, they are unable to get signals from mobile phones or radio. “This makes it impossible for them to receive weather updates from radio or through phone,” he said. He suggested that Digital Satellite Phone Terminal (DSPT) service be used to alert the nomads about extreme weather events. The national telecommunication corporation of India, Bharat Sanchar Nigam Limited (BSNL) has already starter the DSPT service in some remote areas. DSPT works on satellite signal, but it is not mobile. This does not have to be a problem. “DSPTs can be installed along the migratory routes of nomads so that they make and receive calls about weather information before making a decision on their movement,” G.M. Mufti, the deputy general manager of telecommunications in Kashmir told India Climate Dialogue. Although the climate change alerts may come, another factor — access to grazing land in a state plagued by armed conflict — may be more difficult to resolve. According to Choudhary, since 1989 when the militancy started in J&K, a huge area from Cham Jodian in Akhnoor (Jammu) to Poonch and Rajori, was fenced by the security forces. “This used to be our favourite grazing area. Now we are compelled to graze our sheep in areas which have been occupied by the influential clans and they charge us when we graze our livestock there,” Choudhary said. According to him, many times in the past, armed militants would sometimes come and eat with them and would even pick up young boys for recruitment and would take away a few of the healthy sheep. The army, Choudhary said, would later come and beat the nomads saying they had hosted militants. “Sometimes, the army would also take away some of our good sheep,” Choudhary said. It does not seem to have improved the situation.